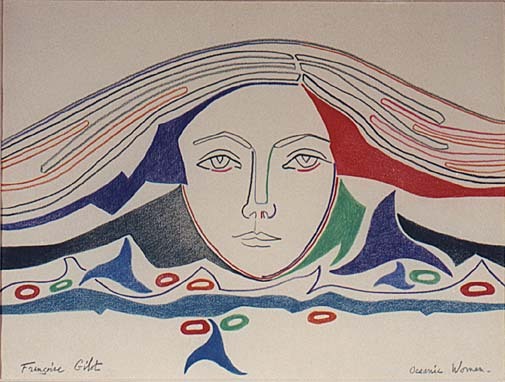 Born 1921 in Neuilly-sur-seine, France, Gilot was honored with her first exhibition of paintings in Paris in 1943. It was at this exhibition that she met Pablo Picasso, beginning a personal and artistic relationship that was to last over a decade. During these years Gilot was part of the circle of French intelligentsia which included such figures as Gertrude Stein, Marc Chagall, Joan Miro and Simone de Beauvoir. However, it was her friendship with Henri Matisse that most influenced her work and her aesthetic sensibility, deepening her commitment to painting. Gilot is also an established writer whose books include "Life with Picasso" and "Interface: The Artist and the Mask". Her artwork is currently represented in over a dozen museums in France and the United States. Pastel drawing on paper, 22 x 30"
Oceanic Woman" is one of a series of original drawings completed by the artist. It is a beautiful flowing drawing that evokes thoughts regarding women's connection to the ocean and nature in general.